1.) 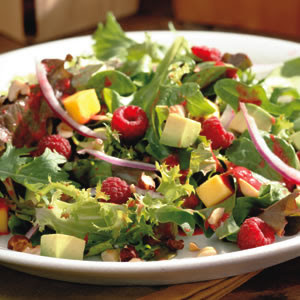 Dressing: Puree 1/2 cup raspberries, oil, vinegar, garlic, salt and pepper in a blender until combined. 2.) Combine greens, mango, avocado and onion in a large bowl. 3.) Pour the dressing on top and gently toss to coat. 4.) Divide the salad among 5 salad plates. Top each with the remaining raspberries and sprinkle with nuts.